Located in the north of Europe on the Baltic Sea, Lithuania offers a unique blend of multicultural influences, with a complex past and modern, cosmopolitan student cities. Home to one of the fastest-growing economies in the European Union, Lithuania offers lower living costs than many Western European countries, and its people are some of the most bilingual and well-educated in Europe. It’s also *relatively* mild, despite its northern location, and an ideal choice for nature-lovers, with a lush mix of forests, gently rolling hills, rivers, streams and lakes. Want to study in Lithuania? Read on to find out about leading universities in Lithuania, student cities, fees, Lithuanian student visa applications and more. Borders Latvia, Belarus, Poland and the Russian exclave of Kaliningrad Oblast. Former Soviet Union state; Lithuania was the first Soviet republic to declare itself independent (in March 1990). Official language is Lithuanian; the most common foreign languages are Latvian, Russian, Polish, English and Belarusian. Celebrates Independence Day on 16th February (a national holiday). A member of the European Union, NATO, the Schengen Agreement and the Council of Europe. Government is a unitary semi-presidential republic with both a president and a prime minister. The Lithuanian language is one of the oldest-surviving Indo-European languages, and is similar to the ancient Indian language of Sanskrit. Main religion is Roman Catholicism. 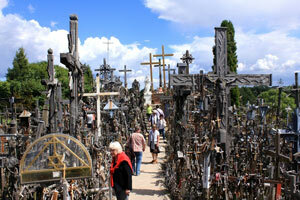 Lithuania is the only country with its own official scent (the appropriately named Scent of Lithuania). Basketball is the national sport of Lithuania. There are five national parks in Lithuania and around a third of the land is forests. Ranked first in the world for the number of hot air balloons per resident. Labas is the typical Lithuanian greeting. Study programs in Lithuania are evaluated according to the European Credit Transfer System (ECTS) and are offered in terms of ‘cycles’, which follow the Bologna system. The first cycle is for bachelor’s degrees, the second cycle is for master’s degrees, and the third cycle is for PhDs. Universities in Lithuania also offer integrated study programs, which combine the first and second cycles so that students graduate with a master’s degree and can then study a PhD if they wish. These are most commonly found in regulated professions such as law and medicine. The largest university in Lithuania and the oldest in the three Baltic states (Lithuania, Latvia and Estonia), Vilnius University is currently ranked 481-490 in the world and 21st in the EECA region. It was founded in 1579 and now has around 20,900 students enrolled, including almost 1,250 international students. The university has more than 150 bilateral agreements with partner institutions and takes part in the Erasmus + exchange program. Also located in Vilnius, Vilnius Gediminas Technical University is ranked 701+* in the world and 43rd in EECA. Established in 1956, it is one of the largest state universities in Lithuania and has become known for its expertise in technical and engineering education, with an innovative and international outlook. The university has received a three-star rating in the QS Stars rating system (an opt-in service for universities), achieving the maximum five stars for teaching, facilities and innovation. Kaunas University of Technology is currently ranked 701+ in the world and 51st in EECA, and is located (as its name suggests) in Lithuania’s second-largest city, Kaunas. 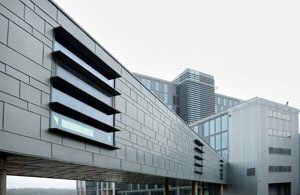 It’s one of the largest technical universities in the Baltic states, with around 10,900 students studying on 156 different programs, 62 of which are offered in English. Also located in Kaunas, Vytautas Magnus University is ranked 701+ in the world and 77th in EECA in 2016-2017. 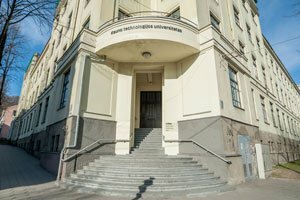 Founded in 1922 (and re-established in 1989), Vytautas was the first Lithuanian university to develop bachelor’s, masters and doctoral degree programs and is the only university in the country to have a liberal arts focus. Lithuanians are friendly and often multi-lingual, with two-thirds of the population able to speak at least two foreign languages. Around 30% of Lithuanians are proficient in English, which is especially common in the younger population. You may wish to try and learn the basics of the Lithuanian language to help you to communicate with locals during your stay, and some universities offer courses to help international students integrate with the language and culture of Lithuania. The capital and largest city in Lithuania, Vilnius has a population of around 542,700 people and is located in the southeast of the country. Students who choose a university in Vilnius are bound to be charmed by the city’s famous baroque and gothic architecture, especially in the Old Town (a UNESCO World Heritage Site). 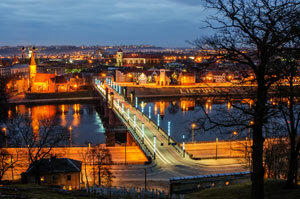 Vilnius also offers a vibrant nightlife, some of the highest internet speeds in the world, and pleasantly warm summers. It’s not short of universities, with Vilnius University and Vilnius Gediminas Technical University and Mykolas Romeris University all located here. 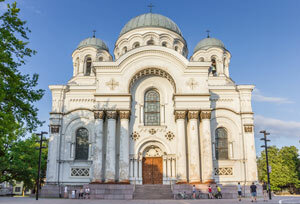 Vilnius was the European Capital of Culture in 2009 along with the Austrian city of Linz. Kaunas is the second-largest city in Lithuania with around 297,700 residents, and is located in the south-central region of the country. The temporary capital of Lithuania during the interwar period, it’s packed with heritage from various eras, with plenty of museums and landmarks such as the 14th century Kaunas Castle. The city has historically been a leading center of Lithuanian cultural, academic and economic life, becoming a major industrial city after World War II. Kaunas is also a university city, with over 35,000 students studying Kaunas University of Technology, Vytautas Magnus University or one of the five other colleges and universities. Klaipėda (pronounced klai-pey-da) is located on the Baltic Sea coast at the north-western corner of Lithuania, and has a population of just over 154,000. The city is very much a mix of old and new, with an interesting history that includes a period as a temporary Prussian capital during the Napoleonic wars, and a time when it was known as Memel under German rule. 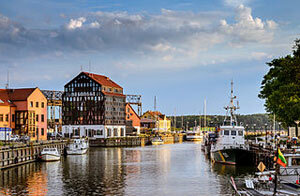 It now serves as the country’s only sea port for large cruise ships and an important gateway in the Curonian Spit, and is close to popular seaside resort towns Nida and Palanga. Where’s your perfect student city? Have your say! Before applying to study in Lithuania, you’ll need to make sure your qualifications will be accepted for your level of study. You’ll need a school leaving certificate (or equivalent) if applying for first cycle (bachelor’s) degrees, a bachelor’s degree or equivalent for second cycle (master’s) programs and a master’s degree if applying for a third cycle (PhD) program. As a foreign citizen, your education documents will need to be evaluated and recognized by the Lithuanian Centre for Quality Assessment in Higher Education (CQAHE), for which you’ll need to submit original copies of your diploma and academic transcript. Another thing to consider is what language you’ll study in. More than 380 English-taught courses are listed on the program search tool provided by the Study in Lithuania website, including 99 university bachelor’s degrees, 139 master’s degrees and 16 doctoral programs. If you want to study in English and are not a native speaker, you will need to take a proficiency test such as IELTS or TOEFL. Likewise, if you’re studying in Lithuanian, you’ll need to pass a proficiency test in the language. Lithuania is a fairly inexpensive country to live in, with Vilnius University estimating costs of €489 (~US$520) per month, or €5,868 (~US$6,240) per year including accommodation, which in student dormitories can be as little as €70 (~US$74) per month. Your mandatory Lithuanian student identity card (LSIC) will not just give you access to the university library, but will enable you to save money at local theaters, cinemas and restaurants. The international student identity card (ISIC) is not essential but will give you access to even more discounts. Students from the EU do not need a student visa. Students from selected non-EU countries such as New Zealand, Australia, the US and Canada (full list here) do not need a visa to enter Lithuania, but should apply for one after arrival. EU students do not need a residence permit, but must register with the Lithuanian Migration Department and declare their place of residence at a local district authority (Seniūnija) within seven days of arrival. The documents needed for a residence permit are similar. You will also need proof that you’ve been admitted to a higher education institution in Lithuania, as well as a document confirming your place of residence during your studies. Your Lithuanian student visa will normally be issued in 15 days. All students can work in Lithuania for up to 20 hours per week starting from their second year of studies, but non-EU students will need a work permit (unless hired during a training period or intending to work in the field of scientific/social research). After graduating, non-EU students can apply for a six-month temporary residence permit in order to stay in the country and seek employment.